When I bought the tickets to St. Augustine, the plan was in part to give Bob's skin some relief from the cold climate -- the bluster of late fall and winter makes his skin dry and itchy, and sometimes even breaks the skin! Warm weather is good in so many ways -- I wanted the vacation to benefit his health. That was the plan, anyway. 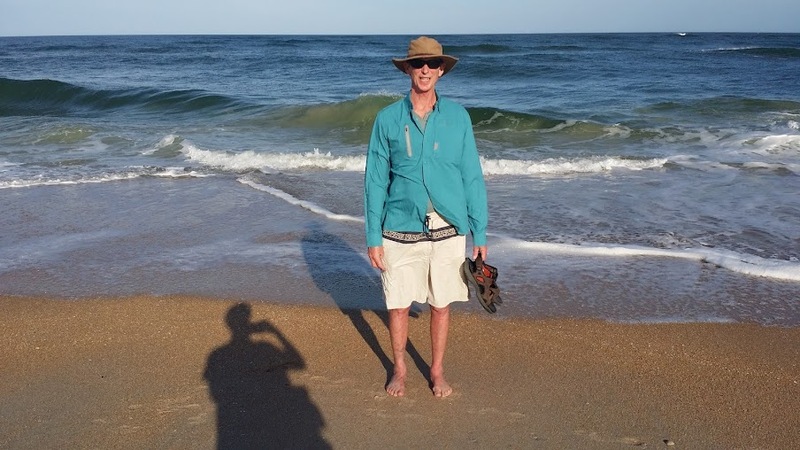 I think I mentioned that Bob is having radiation treatments -- something I hadn't anticipated when we scheduled the vacation. He'd had 4-5 treatments before we left for St. Augustine. The very night we arrived, at the hotel, he discovered that he had blistered in several places from the radiation. So much for fun in the sun, on the beach! Gorgeous as the weather was, he had to dress for protection. We had the foresight to buy UVB protective shirts from LL Bean, and what a genius move! Here he is wearing it on a Vilano Beach walk right after we arrived. While we had a great time in St. Augustine, the CTCL impacted our enjoyment. The blistering from treatment was not unexpected, but there were other unpleasant surprises. As we were walking around, Bob complained that his feet hurt. When he slid off his shoes we found his feet were swollen and purple. We sat down on St. Georges street and he put his feet on my lap to elevate them. We still don't know what caused that. He also has been having bouts of nausea, and his appetite is not what it used to be (he's lost about seven lbs. since July). Bob is fighting to maintain a normal lifestyle, but he has made concessions. He is not working (though he hopes to return to his job after his radiation). He has started wearing clothing he wouldn't normally wear -- he would not normally wear sweats except to the gym, and now he wears them much of the time. He doesn't do activities late in the day, when his skin is itchy. He is fighting against the symptoms of CTCL to continue his normal activities -- he goes contra dancing, and we bike, despite the fact that he has a bad skin reaction 5-6 hours after exercise. I worry that at some point he will have to face some limitations on what he can do, and what we can do together. It is scary. I'm writing in a moment of pessimism. He is being treated and the initial results are promising. I need to focus on that. You're allowed to be pessimistic sometimes. You aren't a wallower. I'm so sorry Bob is having to go through this. He can do it though! I'm praying for him! Bless you and Bob while you fight this frustrating illness. Will continue praying for more positive breakthroughs.